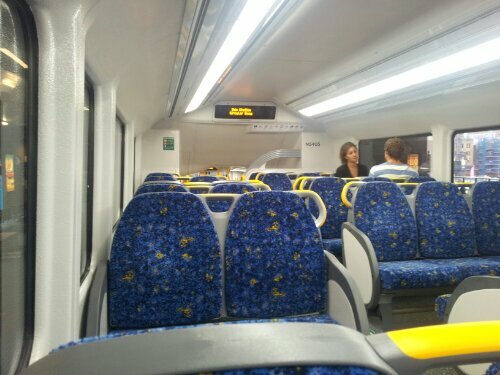 I finally got to ride on a Waratah tonight (set A5, car N5405), and I must say I wasn’t impressed. The key issue I had was sideways wobble – it was significantly worse than a Tangara even, and I was feeling a little motion sick by the end – I didn’t even realise the track was so rough around Petersham until today. I take it the suspension is different to the Milleniums, and perhaps a single cushion. Aside from that the seats were extremely hard (harder than I ever remember the M bug’s seats being when first introduced), and the stairway handrails are thin which would be uncomfortable if you had to stand for a long trip. The quality of the fitout seemed ok though, and the motion of the seats was very nice. The automated announcements were rather quiet and were often drowned out by background noise, but I expect this is a simple setting. The interior seemed to be modernised just for the sake of modernising it, when the M bug interiors are still fine. Unfortunately they are just as subject to vandals as any other train, with the windows being scratched up already. Overall verdict – they should have stuck to the proven Millenium design, and really need to do something about the sideways wobble.